Suffice it to say that we never do economic forecasting of any kind at Keating Wealth Management, because no one can forecast the economy in the short- to intermediate-term. More importantly, it doesn’t matter for a multi-decade/transgenerational investor. The “redux” refers to previous articles by Bogle, published by The Journal of Portfolio Management in 1991 and 1995, about a simple methodology for establishing reasonable expectations for stock and bond returns over decade-long periods based on the sources of return that have driven their results. In his 1951 honors thesis at Princeton, Bogle quoted a warning from John Maynard Keynes: “It is dangerous to apply to the future inductive arguments based on past experience, unless we can distinguish the broad reasons for what the past was.” Keynes attempted to explain the past by boiling down the source of stock market returns to two factors: enterprise and speculation. Enterprise refers to the intrinsic value that businesses create (i.e., earnings), and speculation is effectively the fluctuations in valuation. But Keynes made no attempt to quantify these elements, so in his original 1991 article Bogle took on the task of attempting to establish a “reasonable expectation” for stock and bond returns for the ensuing decade. For his stock model, Bogle relied on just three factors; for his bond model, just one factor. + expected annualized change in the P/E multiple (relative to the historic norm) during the period. And with over 125 years of data now available, it’s safe to conclude that the results are in. Since 1871, the annual investment return of stocks has been 8.6%. It’s been a steady, upward sloping trend line. By contrast, the speculative return has fluctuated wildly during the period, and the net annual addition to stock returns over the last century or so has been a mere 0.4%. So the 9.0% average annual return of stocks over the preceding century is almost entirely attributable to earnings. So how has the Bogle model performed as a predictive tool? In short, reasonably well, with about an 81% correlation between actual and predicted returns over 10-year periods. Bogle also came up with a single factor for predicting bond returns over the ensuing decade: the current yield (interest income divided by market price) at the beginning of the period. Looking at rolling 10-year periods going back to 1906, about 90% of the subsequent returns on bonds are explained by their initial yields. Capital gains and losses have almost no impact on return. 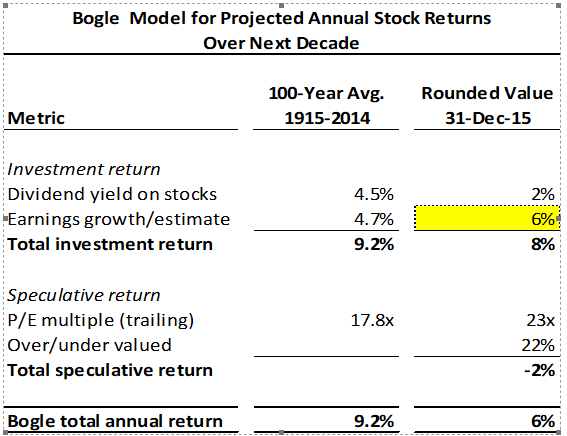 So, according to the Bogle model, what’s ahead for stocks and bonds over the next decade? As of year-end 2015, the dividend yield on stocks was 2.1%, which is less than half the average of 4.5% over the last century. And while the long-term nominal earnings growth has averaged 4.7%, over the past quarter century, the average has been 6.2%. So, in deference to the recent past, perhaps 6% might be a reasonable guess. This would bring the prospective annual investment return to 8% (2% + 6%). With respect to speculative return, as of year-end 2015 the S&P 500 was trading at a multiple of 23.0x trailing earnings, compared to the historical average of 17.8x. Assuming a reversion to the mean valuation, this would imply a 22% contraction in the P/E multiple, equivalent to a reduction of about two percentage points per year over the next decade. So the 8% annual investment return would be reduced to 6% in nominal terms. Of course, the P/E multiple could also stay the same or increase, and actual earnings growth could be lower or higher than projected. The table below summarizes the calculation methodology, with rounded projected values based on the Bogle model. As of year-end 2015, the yield to maturity on the 10-year Treasury note was 2.3%, far below the long-term average of 5% (over the last century). Based on the Bogle model, this suggests a 2-3% average annual return, in nominal terms, over the next decade. Assuming rounded nominal average returns of 6% and 3% for stocks and bonds, respectively, and after adjusting for say a 2% inflation rate (the Federal Reserve target), the projected real returns for stocks and bonds over the next decade, according to the Bogle model, would be 4% and 1%, respectively. 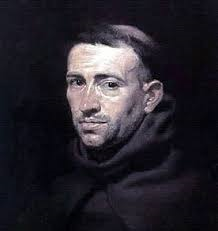 Sir William of Occam was spot on that the simplest solution is always the best. Forget all of the talking heads in the financial media and the Wall Street mumbo jumbo. Simplicity beats complexity. Instead, rely on the past as historical perspective for trying to understand the future. But for heaven’s sake keep it as simple as possible. Remember that neither John Bogle nor anyone on Wall Street or academia has a crystal ball that can reliably forecast future stock and bond market returns. But, using the Bogle model, we can decompose the sources of both stock and market returns, which provides us with a framework to quantify and compare current fundamental and valuation metrics with the past. Other than the dividend yield, you can adapt the model by inputting your own assumptions about future earnings growth and valuations to generate a serviceable estimate of expected stock returns over the next decade. Finally, and most importantly, what matters most for the multi-decade/transgenerational investor is the relative relationship between real (i.e., inflation adjusted) stock and bond returns, and how relative return projections should be factored into asset allocation decisions. In the past, stocks have typically generated two to three times the real returns of bonds. Based on the Bogle model, there is nothing to suggest that this relative relationship will change anytime in the foreseeable future.